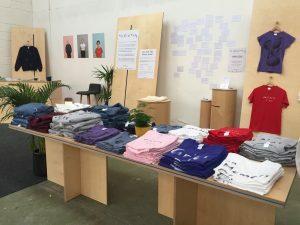 Fevered Sleep launched their touring project This Grief Thing last week by opening a shop in Sneinton market in Nottingham city centre, which welcomes members of the public to come in to think, talk and learn about grief and buy clothes and objects. 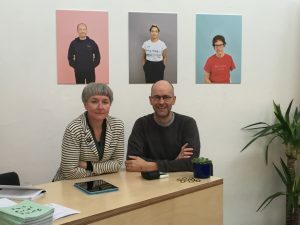 You can find the main shop in Sneinton Market, Unit 8, Avenue C, until Sunday 24 March, where artistic directors Sam Butler and David Harradine will also be hosting Grief Gatherings, small group conversations about grief and grieving. You can also find a pop up version of the project along with a small selection of items from the collection at a number of other locations across Nottingham. As well as the main shop and pop up events, there is also a large scale billboard on Glasshouse Street in central Nottingham. 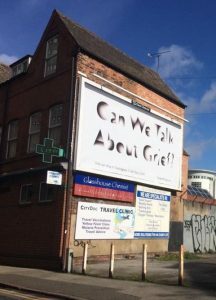 Fevered Sleep encourage members of the public to share images of the billboard to help make conversations around grief and grieving more public and visible. If you haven’t yet had the opportunity to visit the shop, make sure you visit and experience the project before it finishes on Sunday 24 March.